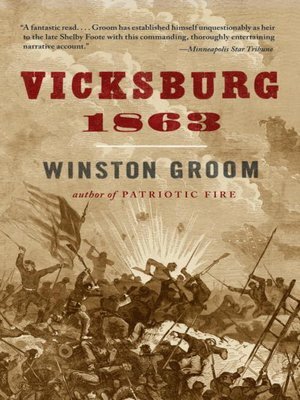 In this thrilling narrative history of the Civil War's most strategically important campaign, Winston Groom describes the bloody two-year grind that started when Ulysses S. Grant began taking a series of Confederate strongholds in 1861, climaxing with the siege of Vicksburg two years later. For Grant and the Union it was a crucial success that captured the Mississippi River, divided the South in half, and set the stage for eventual victory. Vicksburg, 1863 brings the battles and the protagonists of this struggle to life: we see Grant in all his grim determination, Sherman with his feistiness and talent for war, and Confederate leaders from Jefferson Davis to Joe Johnston to John Pemberton. It is an epic account by a masterful writer and historian.